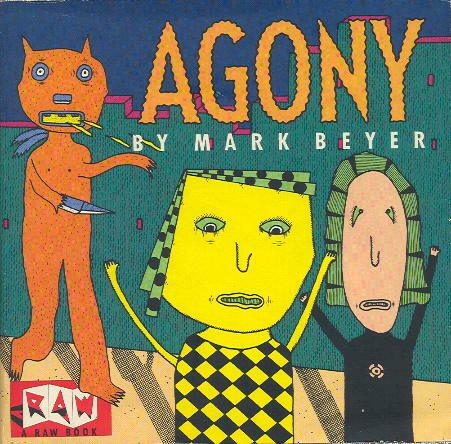 This little paperback book (with dustjacket) by Mark Beyer only measures about 5 by 5 inches, but packs in plenty of black humor and peculiar art. The premise is that a couple, Amy and Jordan, start their day by getting fired from their jobs, and things only get progressively worse from there. There are beheadings, prison stays, giant swelling heads, hospital horrors, and more, made even more terrifying by the off-kilter, almost childlike, illustrations of the characters and their miserable situations. Amy and Jordan face their endless string of misfortunes with a mix of optimism, depression, and occasional outright terror, all for our amusement. And it is amusing, as things pile on and the two find themselves inextricably trapped by the workings of fate. It’s a neat little book that grabbed my eye when I spotted it on a convention table over twenty years ago, and even now, as I was flipping through it to write this post, I ended up just reading the whole thing again. 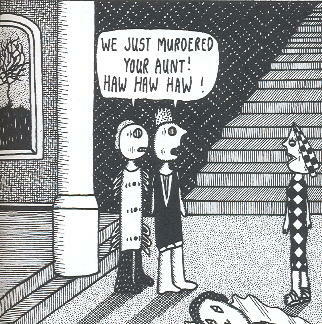 And I was reminded of my cousin, who was only about 11 or 12 at the time I bought the book, picking it up and reading it straight through during one of her family’s visits. “Poor Amy and Jordan!” I remember her saying once or thrice during her perusal. The book’s out of print, but I put up an Amazon link where you can find some slightly pricey used copies at (right now) $18 a pop. There’s also (at the time I write this) a new copy for $180, which seems a tad much, but hey, if he can get it, more power to him.